LABARRE, La. - State biologists are trying to determine what killed an estimated 500 birds that littered a quarter-mile stretch of highway in Pointe Coupee Parish. The birds included red-winged blackbirds and starlings. The birds were found Monday along Louisiana Highway 1, about 300 miles south of Beebe, Ark., where more than 3,000 blackbirds fell from the sky three days earlier. Authorities say examinations showed those birds suffered internal injuries that formed deadly blood clots. Louisiana state biologists are sending some of the birds found at Labarre to laboratories in Georgia and Wisconsin for testing. The New Year's Eve bird showers in Arkansas, followed by the death of thousands of fish nearby in the Arkansas River, have raised interest on the internet and elsewhere, including by some who see the strange events as signs of the apocalypse. Experts said Monday that celebratory fireworks were likely responsible for the Arkansas bird-bombing, though they admit that it's unlikely they'll ever pinpoint a cause with certainty. "They collided or were hit by something that caused hemorrhages or bleeding, internal bleeding or bruising," Karen Rowe, an ornithologist at the Arkansas Game and Fish Commission, told CBS News. Some speculated Monday that a bout of bad weather was to blame. Others said one confused bird could have led the group in a fatal plunge. A few spooked schoolkids even guessed that the birds had committed mass suicide. "There was probably some physical reason, but I doubt anyone will ever know what it was," said Thurman Booth, the state's wildlife services director. 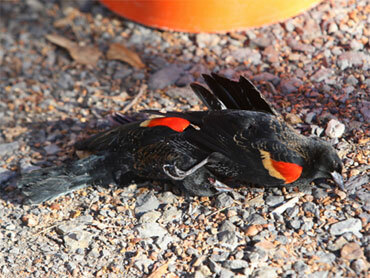 The birds were the second mass wildlife death in Arkansas in recent days. Last week, about 83,000 dead and dying drum fish washed up along a 20-mile stretch of the Arkansas River, about 100 miles west of Beebe. Wildlife officials say the fish deaths are not related to the dead birds, and that because mainly one species of fish was affected, it is likely they were stricken by an illness. Full test results could take up to a month. Red-winged blackbirds don't fly at night because they can't see where they're going. That explains the crashing, but what caused thousands of them to panic and leave the safety of their roosts can't be known for certain, reports CBS News correspondent Don Teague. Residents heard loud fireworks just before the birds started hitting the ground. "They started going crazy, flying into one another," Game and Fish Commission spokesman Keith Stephens said.